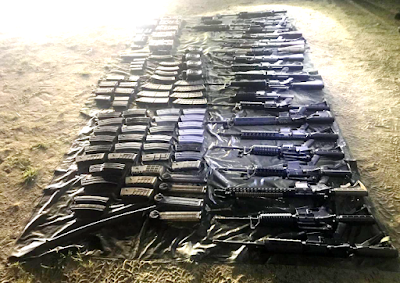 Elements of the Ministry of National Defense (Sedena) secured weapons in the mountain area of Badiraguato, Sinaloa. 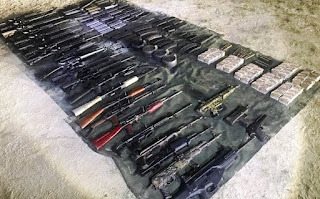 The arsenal was located when the military carried out reconnaissance work in the vicinity of San Jose de la Puerta, located 11 kilometers from the area where last Sunday another group of soldiers came under attack from gunfire. Among the confiscated weapons include; AR15s caliber 2.23. 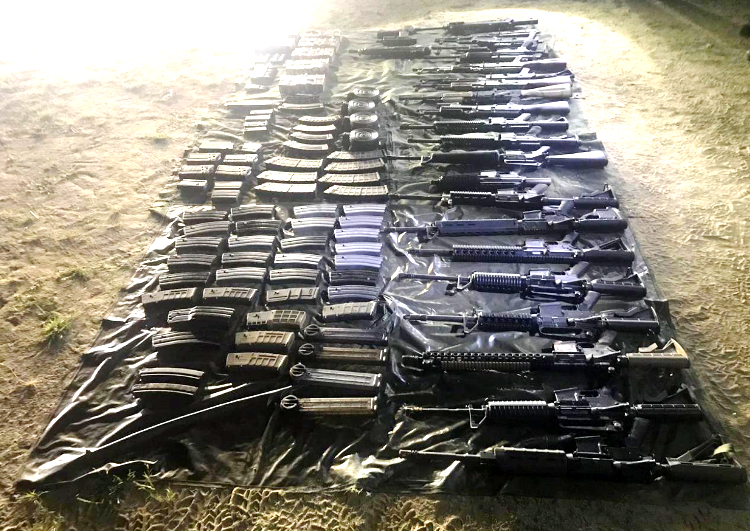 M4 rifle caliber 2.23, AK47s rifles caliber 7.62x31 mm, AR57s caliber 5.56, M16 caliber 2.23 Beretta, automatic MP-5 pistol, UZI submachine gun, 357 desert eagle, and various ammunition. Badiriguato - El Chapo hometown. Is El Mayo around as well? Good to get some bullets off the street. They warned the the dwellers, via loudspeaker, get out we are coming in 30 minutes, therefore that is why, no one was captured. They ALWAYS do, maruchan eating crack heads know better. I wonder How many of those weapons can be traced back to the fast and Furious gun running operation. Doesnt matter cause all of them are made in us of a. So keep on with sending fent to Land of the stupid. 9:01 computerized weapons machining centers are on the hands of Mexican criminals like CJNG, but you could blame Mexican military industries for it, the Mexican army ginirals are always hunting for some spare change, not all of them benefit from selling Campo Marte, Santa Lucia or the heroic military college of Chapultepec or their soldiers' Maruchan. Thanks Chivis. And more weapons from the ATF. Drugs, guns and even vehicles sometimes seized in Sinaloa buy never people captured!!! Goes to show how complicite even authorities are in Sinaloa with criminals. 7:01 the American thug market is taken, do ya unnersteen? All American good boy weapons profiteers won't accept Mexicans selling back their junk army surplus on the US, sorry! Try Guatermala. Any word on the Flores Twins? New name, new bank account, new mansion in a new location far from Chicago. They’ll probably pop up at the Chapo trial. They are hidden in PC until then. thats nothing to chapos people, just an insignificant loss and not even a setback. Yup, the crazy thing is that they're not using them on P90s but on ARs, they use a special upper made by 5.7Center I believe. Mr Costa Rica, I hate think, but in a few days, they will give back, the weapons to the Cartel they favor the most. Of course, in will do it in the cover of darkness. What will they do with those weapons? They should be donated to an Autodefensas group, but I bet you the government, won't want that done. Because it does not care about thier people.If that's the case, then an inventory with serial numbers, to be kept...to see if those weapons grow legs and vanish. That arsenal was for the upcoming Gente Nueva Special Forces training .It was going to be used by the new recruits. No problem CDS has a unlimited credit line with the DOD . Shitload of guns and not one gun manufacturer in MEXICO... Makes you wonder. Ivan will not be happy. He likes to visit his father's stomping grounds and leaves stashes for protection. Maybe they should have a better look around. Like they just found it doing recon. Thats what cops say to cover up that someone snitched. just like the huge meth busts. dam m4s in mexico... how did they get that..